Last week I went to the supermarket to get yogurt plus some other things. While there I was just strolling through the store to the dairy section. I happened to glance in one of the coolers and saw my favorite pork sausage for sandwiches. I grabbed a pack of garlic sausages, which basically are a type of bratwurst. I have never seen garlic pork sausage for sale any other time of the year, other than around St. Patrick’s Day. Funny thing is when I was growing up, I never had bratwurst or any sausage besides the breakfast type. My Dad would get an occasional Italian sausage sandwich from the Fire House during their annual fund-raising event. My sister and I would get meatball sandwiches. My Mom for years would just eat tuna fish from a can when we were feasting on the Fire House sandwiches. She was convinced that she wouldn’t like the spaghetti sauce on the roll since she doesn’t like ketchup on bread. We told her it wasn’t anything like ketchup. Well, when I was grown up, my Dad and I bought meatball sandwiches. Mom as usual was eating tuna, and she remarked to me that my sandwich smelled so good. So I gave her some and she loved it, much to her surprise. She became a convert! So all those years, she missed out. 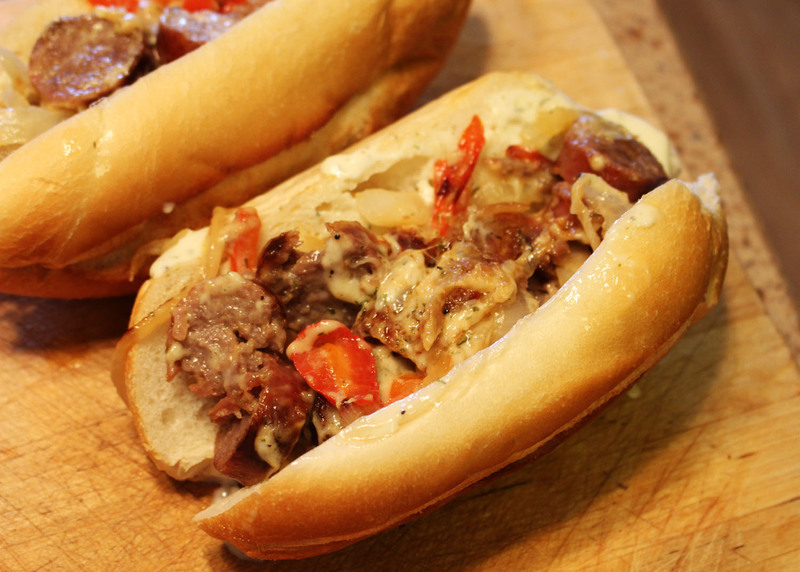 So you are asking, what do meatball sandwiches have to do with a bratwurst sandwich? Well, when I told her I was making the recipe below, she told me she probably wouldn’t like it because she doesn’t like bratwurst. With that said, all I could think about was the meatball sandwich episode. The key is, just to try it, you may actually like it. Slice or dice onions and peppers. Microwave onion and pepper pieces for 2 minutes. Stir the onions and peppers and microwave them for another 2 minutes. 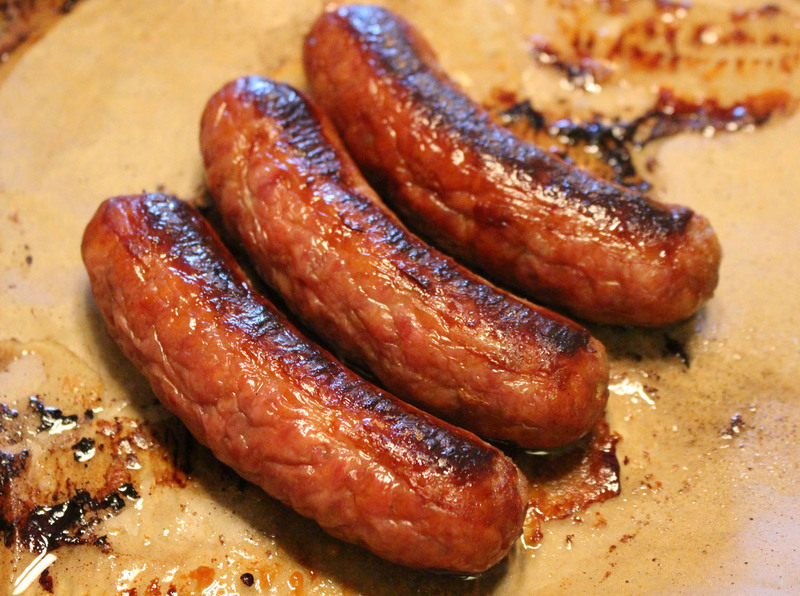 Bake bratwurst for 20 minutes in an oven proof baking dish, turning them mid way. (I line the dish with parchment paper). Add olive oil to a skillet, and saute onions and peppers for an additional 5-10 minutes on low, stirring frequently so they don’t burn. Saute garlic for an additional minute. When bratwurst is finished baking, slice up and place in skillet on medium heat. Add peppers, onion and garlic to skillet and saute for an additional minute. Add 6 tablespoons Caesar salad dressing and mix to coat everything. Add mozzarella cheese to skillet and heat for an additional 1-2 minutes or until it melts. Slice rolls length wise on one side so roll opens like a book. Use the remaining 4 tablespoons of Caesar salad dressing and spread equally on one half of each roll. Divide filling between the 4 rolls and serve.